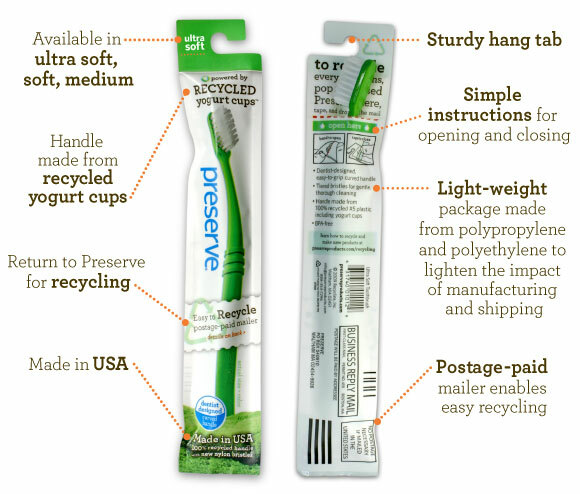 I have toothbrushes from a great eco-friendly company called Preserve. The toothbrushes are manual (remember those? the ones without batteries?) and come in a great mix of colours. The kids' toothbrushes have animal themes which the Dude loves. What's super awesome is that they're made from recycled plastics. And they themselves are recyclable. They come in these great little packages which you can use to mail the toothbrush back to the Preserve, at which point they will recycle them into plastic lumber for park benches, decks, etc. They'll also accept any #5 recyclables by mail. 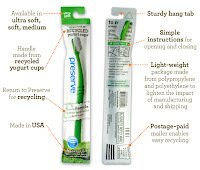 But as much as I love this idea, and am indeed using these toothbrushes, I do wonder about the overall environmental impact of using the postal service and all of its fossil fuel burning trucks, planes and processing depots to send this itty bitty toothbrush back to Preserve to be recycled. They're an awesome company with a great message and lovely execution. But in the back of my mind, I wish that our municipal recycling program was more comprehensive and that I didn't have to send my recycling through the mail to make sure I'm not adding to our landfills.